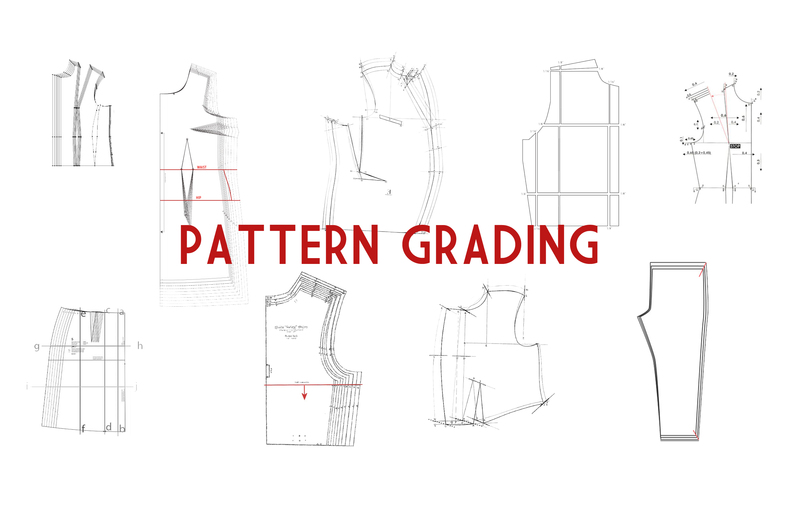 Grading or pattern grading simply refers to the process of producing a range of sizes for your garment. When producing your own clothing line you will want to design bespoke fitting and sizing for your target market. The grading process for your garment is crucial in the manufacturing process as the grading chart will set out the measurements for each size increase and identifies the most functional sizing system for your market. Standard UK sizing can be provided. We, however, rarely recommend this as your garment will have been designed for a specific market in mind and so this should be reflected in the sizing. Also you have designed a unique garment, so attention to the sizing and the grading of the garment is crucial. For any type of clothing manufacturing card sets of the patterns will be required prior to producing the garments. We provide a full grading service, that can include any rules you wish. We work with both digital and manual grades. We have recently worked with a plus size company and a maternity brand helping them develop their own grade rules. An example of size grading for a vest. The sizing. This is, to many people and shoppers, the most important aspect of choosing a new piece of clothing. If it doesn’t fit correctly then people simply won’t buy it. When distinguishing the different sizes for different styles of garments, at the forefront of any clothing companies mind is to grade the sizing so to appease/fit the most people. Whether or not this is your aim, we can achieve any pattern sizing you wish. The grading process involves increasing or decreasing the size of a particular pattern with rules in place, so as to be able to go up and down the sizing chart for each style. Each garment can have various rules put in place that sets out the changes needed between sizes. For example a dress can have a 1” difference with the circumference of the bust, waist and hips as it goes up the sizing chart between sizes 6, 8 and 10. Then a 1½” difference between sizes 10, 12 and 14, rising to a 2” difference in the sizes 16, 18 and 20. The grading for your garments will therefore need to be researched by yourselves. This will enable you to achieve the best-fitting garments for each size for your target market. Do you have a grading enquiry? Whether you are a start-up producing your first collection or an established brand enquiring about changing suppliers. Get in touch today about our grading services!